Our People: Gruber - Your Partner in Aviation. President – Gruber Aviation, Inc.
Renn began his flying career in 1970 in Harrisburg, Pennsylvania and was certified in Newport News, Virginia. Renn lived in Alabama, Texas, Ohio Pennsylvania, North Carolina and Florida before making his home on St. Simons Island, Georgia. He attended Davidson College in North Carolina, graduating with a Bachelor Arts Degree in Business. Renn was a 1st Lieutenant in the U.S. Army Corps of Engineers and served in Vietnam. After an honorable discharge, Renn became a Terminal and Relay Manager for Roadway Express for the next six years. 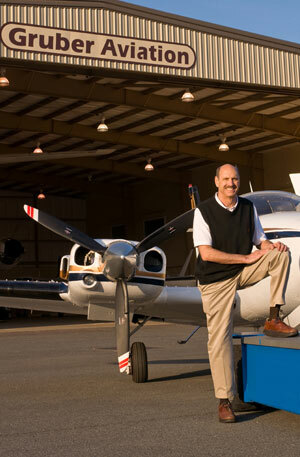 In 1975, he founded and was President of Airway Express specializing in air charter and air taxi flights. He joined Morgan Stanley Dean Witter in 1978 as a Financial Adviser and retired as Senior Vice President–Investments after 28 years. In 2002, he formed Gruber Aviation Inc. As President of Gruber Aviation, he leased the hangar to the United States Secret Service as the central command center during the G8-Summit in 2004. In addition to Gruber Aviation, Inc., Renn founded St. Simons Executive LLC in 2007 to provide private flight service to exclusive members. He is also a commercial pilot with a multi-engine rating with over 3,500 hours of flight time and is type rated in the Lear Jet and the Super King Air 300.